Scientists using NASA’s Hubble Space Telescope discovered a new class of planet outside the solar system. The planet, composed almost entirely of water, is larger than earth but smaller than the planet Uranus and is said to be so hot that a thick layer of steam atmosphere engulfs it at all times. The planet known as GJ1214b located just 40 light-years from Earth was discovered back in 2009 by David Charbonneau . 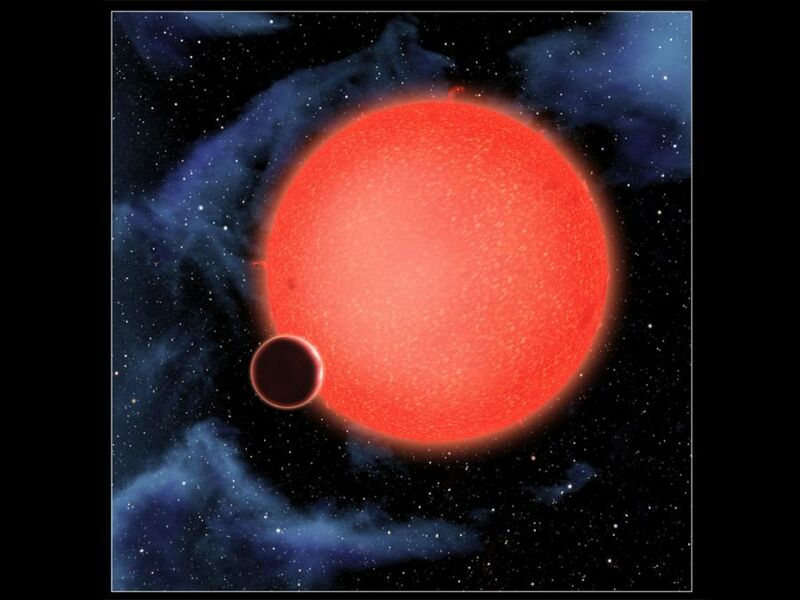 GJ1214b is a super massive planet – 7 times more massive than the Earth with a diameter 2.7 times as large. The temperature on its surface is scorching hot measuring approximately 450 degrees Fahrenheit – the result of its extreme proximity to its sun – a red-dwarf star which its circles every 38 hours in a distance of about 1.3 million miles (Earth orbits the sun at a distance of 1 AU or around 93 million miles). More recently scientists were able to measure the atmosphere of GJ1214b, finding it likely to be composed mainly of water. However, it was not clear if this observation was due to the planet’s atmosphere being filled with steam or engulfed in an everlasting haze. Using Hubble’s Wide Field Camera 3 (also known as WFC3) scientists were able to observe and measure the infrared color of sunset on GJ1214b. This was done using a method called transit where the star’s light is filtered through the planet’s atmosphere, giving clues to the mix of gases the planet is made of. Hubble observations helped the scientists differentiate between a steamy and a hazy atmosphere on GJ1214b. According to the study the GJ1214b spectrum was said to be featureless over a wide range of wavelengths. In other words the Hubble data is more consistent with the hypothesis that GJ1214b dense atmosphere is made out of water vapor. Since Hazes is more transparent to infrared light than to visible light, Hubble’s observations help tell the difference between a steamy and a hazy atmosphere. and the result is that it is more likely that GJ1214b has a steamy atmosphere. More on this story can be found on NASA’s Hubble website. TFOT has previously reported on many exoplanet related storied including a research including the discovery of a planet forming region around an infant star done by the Spitzer Space Telescope, an MIT study showing that young planets stay hot longer than previous expected and a University of Michigan study which discovered that water vapor forms spontaneously in regions of solar systems capable of supporting life. NASA’s Kepler Telescope Launched Successfully First Water on an Extrasolar Planet Herschel Delivers Its First Images Ulysses’ Farewell Carbon Dioxide…in Space? Artificial Burger Just around the Corner? What will the Google AR Glasses be Like?